Aberdeen City Council officials are warning that the amount of fruit and vegetables served in school meals might have to be cut if budgets are not increased. They say price rises are putting increasing pressure on catering. Plans for a new fruit and vegetables supply contract covering Aberdeen and Aberdeenshire will be discussed by the city's finance committee next week. Running for up to four years, it would be worth up to £1.1m. Members are being urged to approve the start of a tendering exercise in collaboration with Aberdeenshire. The report says that while the current provider has maintained its prices since 2013, market forces including the declining pound against the Euro, bad weather in Europe and an increased appetites for fruit and vegetables have all contributed to price rises for crops which have to be imported. It warns that if budget funding is not enough to meet increasing costs, the amount of fruit and vegetables offered in school menus and other catering services will need to be reduced. 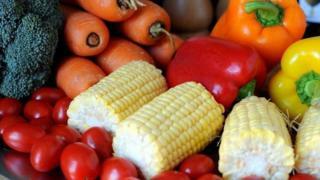 A report last month said eating 10 portions of fruit and vegetables a day may give a longer life.